A fascinating collection of more than 4,000 photographs uncovered in the Historic England Archive is giving up its secrets after more than 70 years and is now accessible to the public. Staff at Historic England’s Archive in Swindon recently discovered 4,050 black and white photographic prints taken by the Topical Press Agency, documenting healthcare in Britain between 1938-1943. 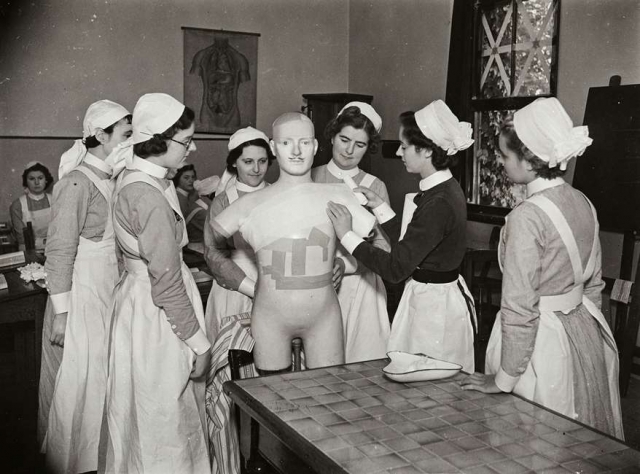 The images provide an invaluable and extraordinary insight into medical and nursing practices during the Second World War and immediately before the foundation of the National Health Service in July 1948. Thanks to grant funding from the Wellcome Trust 2100 of the images have now been digitised, and can be viewed and searched on the Historic England website. Historic England has also produced resources for secondary school teachers to help students explore the history of medicine as we mark 70 years of the National Health Service. Historic England is the public body that helps people care for, enjoy and celebrate England’s spectacular historic environment. Historic England offers a range of free education resources as well as running the award-winning DfE-funded Heritage Schools programme.